Gospel Singer/Songwriter Mmema Announces New Single “Adenkama,” (Pampered) Released on Sunday (8th of October, 2017). 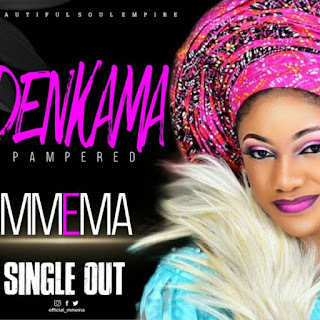 Abuja, NG – Mmema, one of Nigeria’s gospel artists, is thrilled to announce the release of another single, entitled “Adenkama” (Pampered), produced by Gospel Chinemeremu Obi better known as Gospelondebeatz and co-produced by Roy-Xperience. 3. Care for and make very comfortable. 4. To look after somebody very well and watch their back. 5. To do exceptionally well for someone. “Adenkama” will be available for free on ReverbNation.com and My.NotJustOk.com. “Adenkama” will also be available on iTunes, Amazon Music, Google Play and other top digital distribution platforms soon. “Adenkama” is a song of gratitude to God for unexpected blessings, undeserving kindness, uncountable miracles and answered prayers. It’s a song for a nobody who became somebody by grace. It’s a song that the unqualified sing when God makes them sit at the table with the qualified. It’s for that woman they said will never be a wife or a mother, who became one. It’s a song the rejected sing when God makes them recieve honour they thought they’d never get. Oh and finally I would say it’s a song to celeberate life especially in this trying times. You have survived, you are still moving forward despite the odds, despite recession, despite a very limited past, despite all your trials, despite every humiliation and mockery, you have emerged from the ashes better, stronger, wiser and more grateful to God than ever. Thank God for always picking up the impossible cases and solving them. You have enjoyed heaven’s love. Some could say this falls into a Soukous style of music, but I will say it’s a blend of English and my local dialect. The melody and percussive nature is great for dancing and thankgiving celebrations. I am sure that it is the next praise anthem that will rock the nation. Remember to request for Adenkama when you are going to dedicate that promise baby they said will never be born, when you are healed of that deadly disease, when you survive that ghastly motor accident. Use it to dance into that wedding they said will never take place. Oh and when you get that degree or masters they told you will not be a reality, sing Adenkama. When you buy your car and house in this recession, you should definitely sing Adenkama. Perhaps best known in Abuja as Evang. Dr. Kufre-abasi Eyo’s wife and/or Co-pastor of Winners House of Faith Church Int’l or for her debut single “Dew” (which got a lot of positive reactions from fans) or for her work with Ibom Praise Syndrome, Elshaddai Family Choir at Uniuyo in Akwa-Ibom State and Tribe of Judah (TOJ) Choir in their debut and subsequent albums. The Nigerian Gospel music artist Mmema continues to build momentum as a solo performer in the Nigerian music community as a songwriter, singer, artist, poet, author and musician. She is a very amiable personality and always carries a graceful and peaceful ambience around her. She has shared the stage with the likes of Sammie Okposo, Freke Umoh, Princess Ann Inyang, Aity Dennis, Asu Ekiye, Samsong, Uduak Akpan, Esther Edoho among others all during her outstanding work with Ibom Praise Syndrome. One of her songs written for and performed with Ibom Praise is titled “Adenam”, after 12 years of its release is still very trendy and currently one of the few songs you can’t miss hearing on so many altars every Sunday morning or at occasions. Pastor Mmemaobong is an independent gospel artist. She is a creative writer whose deeply-felt lyrics, mesmerizing stage presence and powerfully evocative lyrics translate into unforgettable experience. Focused on helping people to know who God is, His bountiful and boundless love towards mankind, and living a life that pleases God in her ballad and mid-tempo style of music. Pastor Mmemaobong holds a Bachelors Degree in English from the University of Uyo, and she is the founder of The Resilient Women Ministry, whose sole vision is to see the resilient Spirit of God reawakened in every woman. Pastor Mmemaobong is happily married to Evangelist (Dr.) Kufre-Abasi Eyo and they are blessed with three adorable children. Check her social media profiles for updates on her songs.